A gel that’s made out of Honey? It’s true. Honey Stinger Gel is a gel with one of its main ingredients as honey. I got a chance to try it a few days ago, and liked it! The gel itself has 120 calories, making it stack up to its competitors quite fairly. It’s gluten free, so if you’re on a gluten free diet, it’s a perfect gel for you. The taste and texture? Surprisingly thin. It’s thiner than the most popular gels out there, but perhaps thicker in consistency compared to Power Bar’s gels. Interested in more gels? Check out this nutrition page to see more energy gels. At the urging of a fellow co-worker at OneTri.com, and awesome triathlete, I sampled a GU Chocolate Mint. Imagine trekking through a rural village in the Swiss alps. You’re hungry, cold, and homeless for the night. It’s snowing, and you need shelter. Upon finding a single and desolate house still lit, with the chimney on to boot, a family welcomes you in, and feeds you a glorious meal. At the conclusion of dinner, they tell about a special and modest dessert that they eat only on special occasions. They decided to make it, as you and your girlfriend have been quite the enchanting guests. They spread the finished product on a sweet biscuit – it looks like chocolate spread. The both of you take a bite, and you’re transported through some of the sweetest life moments. Your first kiss, your first successful bike ride when you were 7, and the first time you make it down a black diamond back in college. The night wraps up, you go to bed, and you return home back to the States several weeks later. You’re unable to find this dessert again, and no one seems to know that you’re talking about. 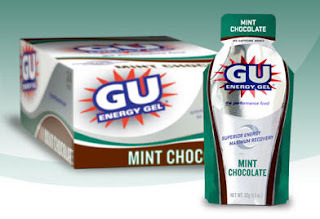 After tremendous despair, you find you’re able to get it at OneTri.com in the form of Chocolate Mint GU when looking for triathlon gear. See more gel solutions on this link GU nutrition. A new nutrition product came into the warehouse recently – PacificHealth Lab’s 2nd Surge nutritional gel. The company behind Accelerade, PacificHealth Lab has been a pioneer in sports nutrition. What makes 2nd Surge special is the fact that it uses all natural ingredients of carbs, protein, caffeine and antioxidants formulated to delay the onset to mind/muscle fatigue during endurance events. Awesome. It has a mild consistency, and falls within the mid range of thickness in comparison to GU and PowerBar’s gels. Alvin tells me it tastes like candy. It contains 100mg of caffeine, which, if my memory serves me correctly, is 20mg more than a can of Red Bull, or about double shot of Espresso Clif Shot by Clif.